With the recent release of this years Dauphine route, the PracticeBicycle team have been busy designing, planning and ensuring a superb week of cycling on their local roads of the Rhone-Alps in June. With the organisation steering towards shorter stages in pursuit of explosive action, we’re all looking forward to 4 action packed days of race thrills combined with the very best rides. 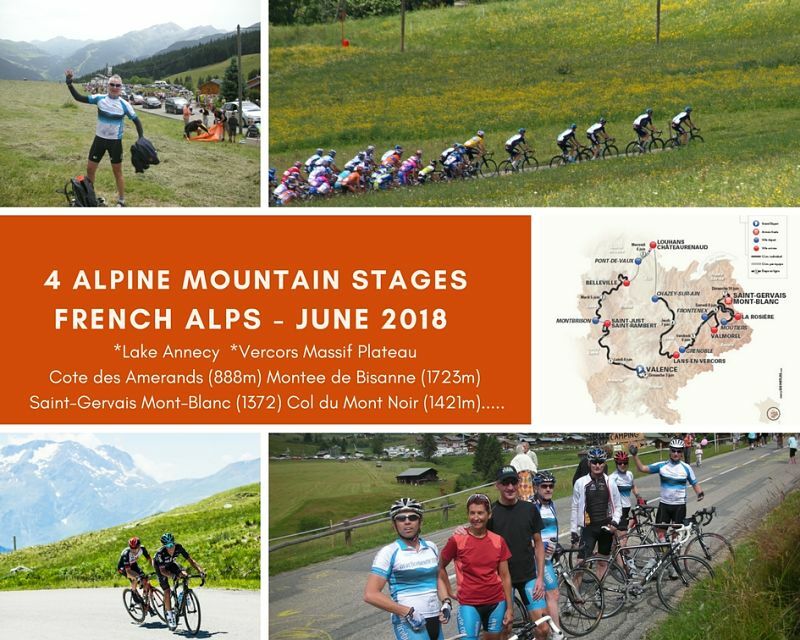 With many cycling stars already on the start list Nibali, Uran, Bardet, Barguil and Martin it will be hot action on the snow capped peaks of the French Alps in June! It’s a great cycling experience for all with the town of Annecy the perfect place to escape to France, take a look a the great riding from last year. Today is our first live action of the Criterium Dauphine 2017 at the finish line on the banks of the Saone River in the city of Macon. We’re expecting the fastest professional racing cyclists in the world to fight for this prestigious stage result before the overall race contenders take on the mountains over the next 3 days. Before we join the live action enjoy a great ride show casing this ‘Cycling Paradise’ as we explore some of the undulating roads to the west of Annecy, away from the Grand Alps and passing over the other major river of France the Rhone River. Once out of town it’s not long before we are on some of the very best cycling roads in the world and heading into the next valley through the natural site of the Val du Fier or for the more adventurous amongst us a little detour for that additional challenge is always available, should you wish! NON CYCLING GUEST: Share the spectacular tour day sights & Wine area! After yesterday’s sprinters on the esplanade in Macon today it’s the time of the climbers in the Alps, we have a superb selection of classic pre-alps rides available for you! These roads may not be considered the Grand Alps but don’t be fooled this could be a critical stage in the Dauphine and also later in July at this year’s Tour de France with the climb of Mont Chat, arguably one of the toughest climbs in France and not for the faint hearted! …it has to be experienced to be believed! Take advantage of your team’s planning and all their local knowledge to give you the best of both worlds with your own superb ride and ‘unique live viewing spot’ for a fabulous day of cycling. Our first destination will be our neighbouring lake of Lac du Bourget, panoramic views all the way and ideal for a café stop. Following along the shores towards a wonderful gem of a wine region with hidden cycling roads, just perfect! We have chosen a favourite and very special French Michelin star restaurant for your celebrations with an equally spectacular view. Whilst at the ideal ‘unique live viewing spot’, it’s time to relax and enjoy the rest of this special day and a memorable moment to absorb the professional peloton during this year’s Criterium du Dauphine! NON CYCLING GUEST: Share all the Tour day & spectacular action in the Mythical Alps! The Dauphine professional peloton will be fired up for this historic mountain stage as for the very first time they will be climbing Alpe d’Huez from the north side! We will also head into the Alps, with our own choice of ride options, tailored to your requirements and supported all the way. The flat roads don’t last very long today before the climbing begins heading towards the Lauteret, get your breath back and admire the awesome hydroelectric barrage du Chambon and Glacier La Meije before pedalling high into the Alps at nearly 2000m! Once at the summit finish in Alpe d’Huez your team has thought of everything for you, get your breath back and enjoy your restaurant lunch. This could be the point the Tour is won or lost! NON CYCLING GUEST: Share all the Tour day & Final Dauphine stage Action in the Alps! Will the Criterium winner be already decided or can the best climbers in the world challenge each other just one more time over this final classic French Alps tour stage? Today enjoy your ‘unique live viewing spot’ on the slopes of the mountain and a superb day at the Criterium Dauphine in 2017. Flexibility with our premium small group allows for the very best ride options; why not test your legs with a classic cycling col…before descending in time for an Alpine recovery lunch just perfect!